In Mindful Living, experienced yoga teacher and author Katie Manitsas explores the concept of conscious spiritual practice through her background in yogic philosophy and Ayurveda. She explains how to incorporate spiritual practice into our everyday lives to create lasting change beneficial to our emotional and physical wellbeing. Spiritual practice has little to do with what we are doing on the outside and everything to do with what is going on inside. Two particular teachings of yogic practice have enabled Katie to embody and live these practices rather than to think about them as abstract concepts. The first is to give ourselves over to a higher power and let go of the modern approach which teaches us to be autonomous and self-directing. Topics covered include kindness and non-violence; yoga; meditation; the rhythms of the seasons; sleeping and dreams; blessings; food; intention and manifestation; relaxation and routine; healing the past; increasing energy; and use of ceremony. Mindful Living is a tool for growth and transformation, bringing us to a place where we expect the unexpected and intuition starts to arise in our lives. Katie Manitsas has been teaching yoga for over 20 years. She holds the highest possible accreditations with both Yoga Alliance and Yoga Australia. Her passions are yogic philosophy and the seasonal practices of Sadhana, bringing devotion and a sense of the sacred to everyday life, compassion for animals and a deep reverence for nature. Katie is the author of several books, including The Yoga of Birth. She is the mother of four young boys and lives with her family in Sydney's Inner West. 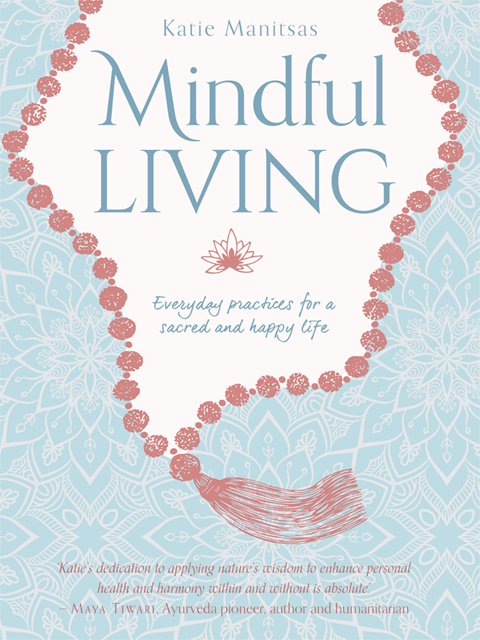 Question: What inspired you to write Mindful Living? Katie Manitsas: The book is really a reflection of my own journey as a busy mum, yoga teacher and human being! It has taken me years to figure out ways to practice mindfulness and become more spiritual in my daily life. I found a lot of the things I wanted to do I just didn't have time for, but over time I figured out ways to bring mindfulness into small moments such as cooking or even cleaning my house. In yoga philosophy we call this 'sadhana' which means conscious spiritual practice in every moment. Question: What is the first thing we can do today to begin living a more mindful life? Katie Manitsas: It depends on what your interests and passions are. For some it will be about becoming more aware of how you prepare food and what you eat. For some it will be about observing your menstrual cycles more closely and how they are in relation to your health and wellness. For others it might be about being more patient or compassionate. One really good place to start for everyone is in taking a few deep breaths. Question: What message do you hope readers take from Mindful Living? Question: How does mindfulness go hand-in-hand with health, self-esteem and happiness? Katie Manitsas: When you feel good in your body, not just because you think it looks good but because it truly feels good then your self-esteem will be radiant. If you wake up in the morning with energy and passion for what the day ahead holds that goes hand in hand with good self-esteem. Mindfulness, gratitude and sadhana can help with this. True happiness isn't about what you have or what you do it is a state of mind.